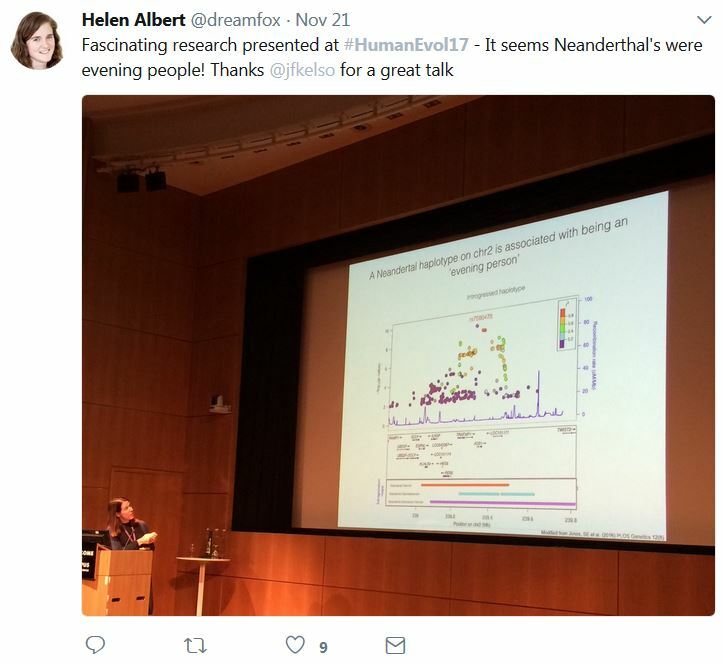 This November over 200 geneticists, palaeontologists, archaeologists, and primatologists, gathered at the Wellcome Genome Campus to celebrate the ancient DNA field at the conference Human Evolution: Fossils, Ancient and Modern Genomes. Funded and organised as part of the Advanced Courses and Scientific Conferences programme, the meeting was a veritable who’s who of the Human Evolution field. Svante Pääbo from Germany’s Max Planck Institute for Evolutionary Anthropology opened the conference summarising his large body of work on ancient DNA and its application to human evolution. Advances in techniques to extract, preserve and characterise ancient DNA from fossils, led to the draft version of the Neanderthal genome, which was sequenced from just three bones found in a Croatian cave. He brought the audience up to speed on progress since then, including details of the complete Neanderthal genome and the discovery and sequencing of a new species called the Denisovans (found in the Altai mountains in Siberia). It seems there was a lot more interbreeding between ancient species and a lot of movement of populations both in the distant past and relatively recently. Recent work has shown that people outside of Africa have up to 2% Neanderthal DNA in their genomes, while those in oceania have 4-5% of Denisovan DNA. Genes inherited from these ancient species gave some advantages to modern humans including those associated with our immune systems, brain and metabolism (from Neanderthals) and the ability to live at high altitudes (from Denisovans). The meeting featured a range of interesting discussions on the dispersal of humans throughout the world, including an engaging discussion on the genomic record of the first Australians, leading to new insights on our species’ ‘trip down under’. There were also insightful talks on the evolution and genetic diversity of the great apes – our closest living relatives – with real life implications for conservation. Of course we are more than our human DNA; microorganisms comprise most of our cells and we have much to learn about our ancient microbiome. Researchers are now looking at calcified dental plaques and paleo-poop to reconstruct our ancestral microbial selves to learn more about our biology and evolution. The scientific programme committee reflected the global reach of this topic with members from Australia, UK, and USA: Chris Tyler-Smith and Yali Xue (Wellcome Trust Sanger Institute, UK), Michael Westaway (Griffith University, Australia), and Jonathan Pritchard (Stanford University, USA). Alongside the daytime sessions four conference speakers (Marta Mirazón Lahr, Brenna Henn, Svante Pääbo and Chris Stringer) took part in a public lecture, deftly chaired by BBC’s Adam Rutherford. This was organised in conjunction with Advanced Courses and Scientific Conferences’ Connecting Science colleagues, Public Engagement, and gave over 200 members of the public the chance to find out first hand how research into ancient DNA is helping us understand our human journey through the ages.